This article aims to try to give simple, practical advice about loft insulation, about the depths, why you should think about it in your loft and whether you actually benefit from having loft insulation. Let’s start with a simple and undeniable fact, heat rises. Whatever property you are in whatever heat you generate eventually rises up through the air and within the property. If you have a loft space then the heat will leach into the loft warming it up, before finally being lost to the outside. The purpose of loft insulation at the joists is to help hold the heat below within the property, reducing the heat loss to the roof void and outside, as well as reducing the amount of heating need to maintain the property at an ideal temperature. After all, if there is no insulation there is nothing to stop the heat leaching out and you need to use your heating more to maintain that comfortable temperature and to reduce the heat loss. As you increase the level of insulation in the loft it will slow the rate of heat loss and maintain the comfortable temperature for longer. So what level of loft insulation do you need? Well, firstly, it depends on the material you are using. The most common type of loft insulation is a fibrous material which is now mass produced and pretty cheap to buy. There are other types of material such as thick rubberised foam board which have the same heat stopping properties as much higher thickness of fibre insulation, but at a fraction of the thickness. However, it is generally much more expensive. For the purposes of this article we’ll concentrate on the fibre insulation. As nearly everyone knows building designs change over time, after all we rarely build now with solid stone, and as a consequence Building Regulations which enforce standards for new buildings have evolved over time to match. As new materials and approaches to building have come into the market so the supervisory standards of the Building Regulations have changed too. For example, asbestos was an extremely common building material in the construction of housing during the 1950s and 1960s, but these days if anyone built a house using large quantities of asbestos, we would be horrified! With fibre loft insulation scientific studies have shown that the most beneficial part of the loft insulation is the first 60 millimetres or around 2.5 inches. This is the part of the insulation that has the most thermal benefit in helping the property below retain heat. Does this mean everything above that is wasted? No!! The modern standard if you were building a house today, or buying a new house, or asking a professional company to install loft insulation into a loft with no insulation would be to install fibre insulation to a depth of no less that 270mm or around 10.5 inches. There are several reasons why. First, like any material, fibrous loft insulation degrades over time. It gets dirty, dusty, can get wet, and exposed to elements. With a suitable depth of insulation it means you can maintain the optimal level of loft insulation for many years, rather than losing efficiency in a shorter period. Second, just because the first 60mm gives you the optimal benefit it doesn’t mean that there is no benefit to the additional 210mm that modern standards recommend. It adds to and reinforces that benefit, thus helping to reduce the heat loss further. So what are the down sides to having loft insulation? Well, the modern fibre insulation is relatively cheap, even with a professional company installing the insulation. There are many government subsidised schemes and grants to help reduce the costs, or for the adventurous types, most DIY stores have plenty of insulation to hand. Just remember to seek advice and wear protection!! The only real downside to utilising fibre loft insulation at the modern standard of 270 mm is really one of space management. It literally makes the loft inaccessible for storage or for anyone to access. With loft insulation at these depths it is nearly impossible to see the joists and therefore safely cross the loft, or to effectively board it out as a storage area. Anyone contemplating using a loft for storage, or wishing to retain that functionality would be better considering alternative materials, such as the foam boards mentioned earlier. We would always recommend talking to a professional company and seeking their advice before undertaking any works. So that’s the simple truth. The right level of loft insulation will help you retain your heat for longer, making your property warmer for longer, and, therefore, helping you to save money on your heating bills. 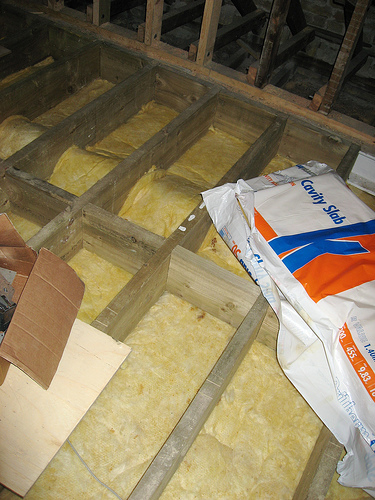 An uninsulated or poorly insulated loft is a house losing money! This really isn’t good enough in a technical article; what I think you mean is that warm air floats above cooler air – convection. From there on it is all about conduction. This really helped with my GCSE coursework being is there’s hardly anything else aha.. I would just like to say that I am appalled by the bad language and total rudeness that Ojlingham has posted. His attack on Keith Farley-Pettman is unnecessary and outright rude. He should be ashamed and banned from usuing this website. The silly thing is they are both right. Hot air is lighter than cooler air and does rise to the top of a ceiling. How do you think hot -air balloons work? There is no convection in a hot-air balloon as it is trapped. Convection is the circulatory effect of cool air being heated and rising. That is why a heater with lower and upper grills placed on a wall are called convection heaters. The air that is cool in a room drops down from a window etc and then is heated by a central heating radiator or electric convection heater and rises to the ceiling. If good loft insulation traps this air like the balloon under the ceiling not letting it escape then we have good loft insulation keeping the house warm and the bills low.